And there's some rumored information, as well (this is via RateBeer): FFF has rented out all of Centennial Park, the former landfill/new park just on the other side of Calumet Avenue as the industrial park home to FFF. Ticket sales may go into the 15,000 range. Let the speculating begin about bottle counts (and prices), ticket prices, and so much more! Here's my speculation.. I wouldn't be surprised if ticket sales drop this year. Before they sold tickets that specified when you can buy the actual Dark Lord, attendance was probably in the 8,000+ range (of course, this was when you didn't need to pay for the privilege of showing up). Craft beer has only become bigger since then. If the ticket price stays the same, I think it will still sell out. Or if they get bigger bands. But they're probably going to have to decouple the beer buying from the event itself. Indiana laws put a hard cap on the amount of beer FFF can produce in a year. While they could make more Dark Lord, that would be at the expense of their other beer (which already doesn't keep up with demand). 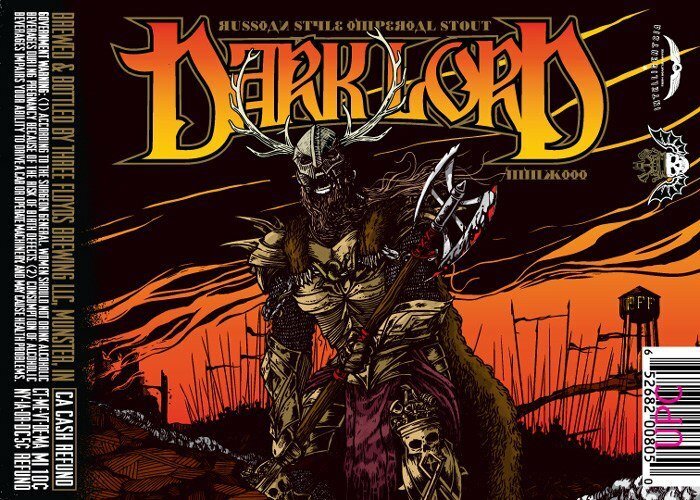 The past two years, at least, have seen ~25k bottles of Dark Lord - assuming they plan on selling 15k tickets, that's not even enough for 2 bottles/person (which is a small amount of beer to walk home with relative to how much work it takes to get it). If they do indeed have the event at the park across the street, they will still have to have the Dark Lord sale at the brewery - otherwise they would have to see the beer to their distributor and buy it back before selling it. Honestly, this would solve many problems and I hope it is exactly what happens. danimalarkey wrote: But they're probably going to have to decouple the beer buying from the event itself. Indiana laws put a hard cap on the amount of beer FFF can produce in a year. As far as I know, Indiana laws do not limit the amount of beer being produced, only the amount of beer to be sold in state. That limit is 30,000 barrels. Seeing as how Chicago is a pretty big market, and they also have the option to expand their sales to more states in the future, I don't think they would have to cut back anywhere. In 2010 FFF produced 15,005 total barrels, in 2011 they produced 20417 total barrels. I hope this doesn't mean I can only buy 2 bottles, that would make me a sad panda. I'm not sure why they altered the formula from last year, it seemed like the event ran pretty well. I was in the last group and didn't observe any problems other than people dropping their beer (the beer carriers they give you are pretty flimsy, but c'mon, you gotta hold it from the bottom). I don't see the bottle limit dipping below 4 bottles per person soon. Last year was fraught with problems and people have been clamoring for these changes for years now. I have been for the past 5 years and unfortunatley will be missing this year due to a wedding. If anyone can snag a few extras, I'd be willing to trade some of my older bottles for this years. Still no confirmation that they're moving the event to Centennial Park (but it seems to be something of an open secret at this point). The FAQ page is still showing information from last year. Not to be too much of an armchair quarterback, but you would think it would have been nice to have an updated FAQ ready to go live when the ticket information is released. 3 Floyds website wrote: Tickets for this event go on sale Sunday, March 17th at 12:00 noon central standard time. So does that mean noon, or does that mean 11 am (since we are no longer in standard time)? That is precisely the sort of question that begs for an answer prior to the event -- but for that reason, probably exactly the sort of question they won't bother to answer. 1. Where/how do you buy tickets (at 11 a.m. or 12 p.m. this Sunday)? 2. How much is a bottle of DL at the event typically? 3. The ticket just grants you access to the grounds, no beer tickets or anything, correct? Thanks. I looked around this post as well as on 3floyds.com and couldn't find answers to these questions, so apologies if I missed it. Thanks! 3. The tickets are required to gain access and to guarantee that you will be able to buy bottles. It will also get you a sample of Dark Lord. 1. I would be ready at 11am just in case (though, honestly, it will probably be Noon). 2. JasonM is correct -- $15 in the past (limit of 4/person). Almost as ever-present as the rumours of the event being held at Centennial Park are rumours that prices may finally get raised this year to $20-$25. I wouldn't expect concrete answers until closer to the actual date. Also, your ticket will determine when you can pick up the beer - though you are welcome to enter the grounds as soon as gates open. 3. FFF gets a lot of bands to play at the event, as well. Metal, mostly, so if that's not your thing, it's beside the point - but from what I understand, they pick very good metal bands, and $30 to hear them play is worth it in and of itself. In addition, you will get a scratch-off ticket -- if this is a winning ticket, you get the opportunity to buy another bottle of Dark Lord. These extra bottles are barrel-aged and have run $50/each in the past. In 2011, the variants were Dark Lord De Muerte (aged in Bourbon barrels with ancho and guajillo chiles), Pappy Van Winkle 23yr Bourbon Barrel Aged Dark Lord, Brandy Barrel Aged Dark Lord and Brandy Barrel Aged Dark Lord with Vanilla Beans. and in 2012, they were Bourbon Barrel Aged Dark Lord, Bourbon Barrel Aged Dark Lord w/ Vanilla Beans, Cognac Barrel Aged Dark Lord, Dark Lord de Muerte (aged in Cognac Barrel Aged w/ ancho and guajillo peppers). Bottle counts have ranged from ~400 to ~800 (I think? ), depending on the exact variant. Odds of winning seem to be about 1 in 4. Unless I'm mistaken, noon CST is 1pm CDT, so the release would be at either noon or 1pm, not 11am. There are plenty of things worthy of argument. Mistyping standard for daylight is not one of them. It'll be at noon. And if it's not, you'll be able to join in the barbarian hordes of beer geeks who raise hell about the oversight. Actually it just says Central Time all over; no mention of Standard or Daylight, although I'm sure it's CDT. But like I said above, noon CST is 1 pm CDT, not 11 am. Welp, that sucked. Finally got into the site at 12:10 and all sold out. The server was slow, but based on a very small sample size (2 friends & myself), we all got tickets. Compare that to last year when I know of 6 who were on at noon and none got tickets. (We lucked out the following weekend when 3 Floyds put a limited quantity up for sale for in-person buyers at the brewpub.) If my small sample is any indication (plus the expanded number of groups), maybe more tickets did go on sale this year. I missed the captcha the first time and was still able to secure a ticket for group E. A friend of mine's crashed during checkout and he didn't get anything; bummer. A buddy & I were both able to get tickets, although for different sessions. He got D and I got E. Guess we'll just have to stay longer! Damn. Looks like I'm going to miss it this year. nr706 wrote: Damn. Looks like I'm going to miss it this year. That's a shame, Tom. These tickets seem harder and harder to get each year. I still have a couple of Dark Lord vintages in the cellar. I'll survive. yeah, I'm in the same boat. I can't go, and because of the strict nature of the ticketing this year I couldn't buy tickets and give them to a surrogate. I guess I will just have to trade for some, or spend 50$ to get some at the twisted spoke. just saw on twitter that today at 9am, they are selling more tickets at the brewery, cash only. Bottle allotment is 3/person instead of the usual 4. The bitchfest on facebook is really entertaining. Dark lord day has naturally gone though some major changes over the past few years I've been attending. As much as I'd like to say I prefer the older smaller event, I actually never made it to one of those. I jumped on the bandwagon when DLD was already too big for its britches. The last 2 years have been understaffed, disorganized, and chaotic, though I always managed to have a great time, happy to make it home in one piece. I'm happy to say this year they finally bit the bullet and owned up to what they really are, a huge freaking festival. The event benefited from a legitimate event staff, more space, and a more organized and relatively clearly laid out system for obtaining your beers. I mostly appreciated the stage to give the bands the audience they deserve. I love a small show but with a captive audience of 1000s of people, it's nice to think bands got a few more fans from taking part. I was originally pissed at the $15 extra for tickets this year, but now that I see that it went to turning DLD into a real festival I'm happy to shell out $30 for a legit music festival ticket with the added benefit of being able to bring and share craft beers with like-minded beer geeks. My favorite part (other than drinking great beers and hanging out with good friends): Watching a bunch of shitfaced middle aged men attempting to mosh when they were hardly able to stand up to begin with. My least favorite part: When RAB, Teresa and Evelyn had to leave early and miss out on being part of, or at least seeing said mosh pit.